We are currently looking to add to our team. We are looking for an experienced groomer interested in part time work. Please stop by the shop between 1pm and 4pm Monday-Wednesday and Fridays to fill out an application. Christy has owned Fur and Feathers Pet Grooming since 2004 when she graduated from Critter Clip's Grooming School. At the age of sixteen Christy started in the veterinary field. Her heart has always been with animals. She held careers as a veterinary technician until 2003 when she changed her pursuit to grooming. As well as working as a vet tech Christy donated much of her time to dog and cat rescue including work with groups such as All Breeds Rescue, 9 Lives Cat Rescue, Rocky Mountain Greyhound, as well as her own private rescue work which continues until this day. Along with her three two-legged children she has many four legged children. 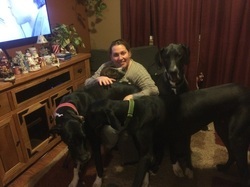 She has three Great Danes Apollo, Eros, Shenzi and a pitbull named Athena. Her cats (which do not included our permanent shop cats) are TK, Zeus, Lucy, and Callie. Her new found love is for her assorted hens, ducks and turkey. Angie has been a bather at Fur and Feathers since 2012. She has two fur babies of her own, DJ who is a border collie mix and Opie who is a heeler mix.